I stopped by the Rural King today and checked to see if they had six volt batteries. My searches on the Rural King's website did not turn up anything and ringing the store I got put on indefinite hold. The answer is yes, Rural King does carry six volt batteries and they are cheap compared to Advance Auto. A Rural King six volt battery is $44.99. Advance Auto's battery is $96.99. The Advance Auto battery lists 640 CCA, 800 CA and comes with a one year warranty. The Rural King battery lists 625 CCA, 750 CA and comes with a one year free replacement and a two year limited warranty. What do you think guys? 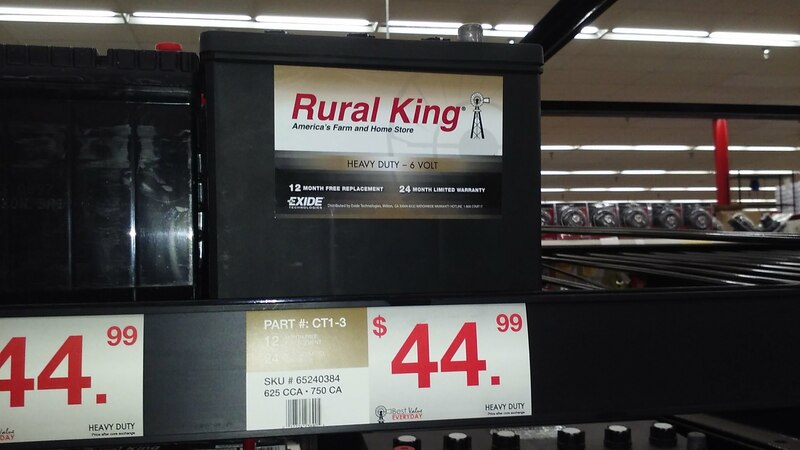 The Rural King is lower in CCA but look at the price difference and warranty.